Expedition 43 Commander Terry Virts of NASA, Samantha Cristoforetti of ESA and Anton Shkaplerov of Roscosmos landed their Soyuz TMA-15M spacecraft in Kazakhstan at 9:44 a.m. EDT. Russian recovery teams will help the crew exit the Soyuz vehicle and adjust to gravity after their stay in space. The trio arrived at the International Space Station on Nov. 24, 2014, and spent more than six months conducting research and technology demonstrations. Virts, Cristoforetti and Shkaplerov spent 199 days aboard the space station and clocked almost 84 million miles during their time in space. Virts has logged 212 days in space on two flights, the first of which was on space shuttle mission STS-130 in 2010. Shkaplerov has spent 364 days in space on two flights, the first of which was on Expedition 29/30 in 2011. This was Cristoforetti’s first flight into space. The station now is occupied by Expedition 44 Commander Gennady Padalka of the Russian Federal Space Agency (Roscosmos), Flight Engineer Scott Kelly of NASA and Mikhail Kornienko of Roscosmos. Kelly and Kornienko are two and half months into their year aboard the complex collecting valuable biomedical data that will inform future deep space, long-duration missions. 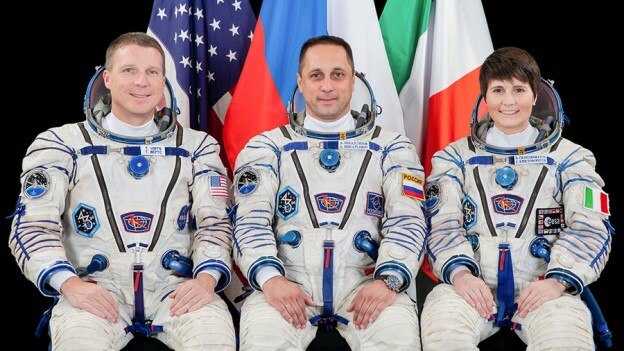 The remainder of the Expedition 44 crew, NASA astronaut Kjell Lindgren, Russian cosmonaut Oleg Kononenko and Kimiya Yui of the Japan Aerospace Exploration Agency, is scheduled to launch from Baikonur, Kazakhstan, in late July. Some items returning on this Soyuz were used as part of research investigations aboard the International Space Station. Equipment that supports various studies which use dosimeters will return with the crew. Dosimeters are devices that measure radiation. Several investigations employ the dosimeters to gather information about space radiation to help manage exposure and provide protection to crew members. Both the Area Passive Dosimeter for Life-Science Experiments in Space (Area PADLES) and the Dosimetric Mapping (DOSMAP) investigations aboard the space station help researchers collect data to design radiation monitoring equipment for astronauts. This knowledge may improve design for spacecraft structures that shield internal occupants from radiation. Scientists also may use the data to develop protection devices for people who work in medical or industrial areas with potential radiation exposure. Samples from the ongoing Study of the Impact of Long-Term Space Travel on the Astronauts’ Microbiome investigation also will return. The Microbiome study looks at the impact of space travel on the immune system and on human microbiomes – microbes living in and on the human body at any given time. Samples from crew members’ bodies and the space station environment are taken periodically to monitor changes in the immune system and microbiomes. The results of this study may add to research on health impacts to people who live and work in extreme environments on Earth, and help with research on early disease detection, metabolic function and immune system deficiency. JSC2014E088152 (10/23/2014) — Official photogragh of the International Space Station Flight Engineers US Astronaut Terry Virt, European Space Agency Astronaut Samantha Cristofretti, and Russian Cosmonaut Anton Shkaplerov. 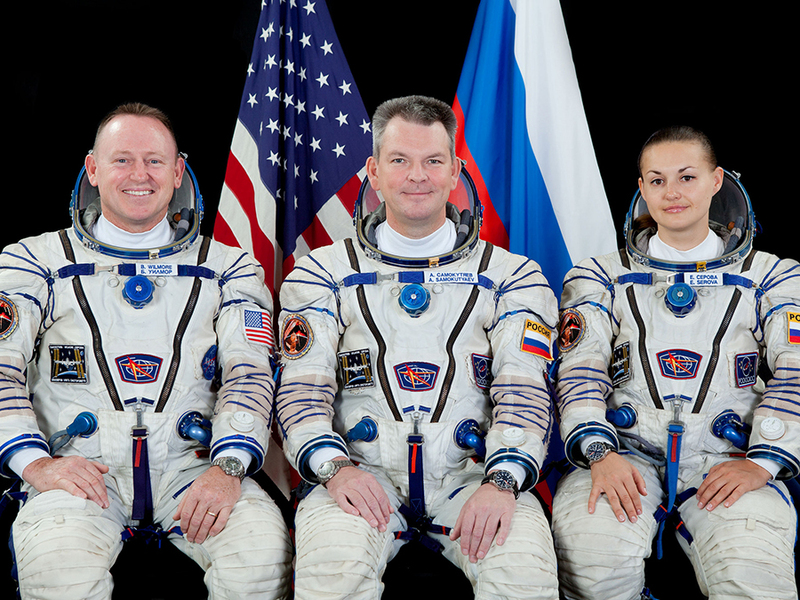 Expedition 43 crew members Terry Virts, Anton Shkaplerov and Samantha Cristoforetti will return to Earth June 11 at 9:43 a.m. EDT. The trio from the U.S., Russia and Italy will enter the Soyuz TMA-15M spacecraft, undock from the Rassvet module and land in Kazakhstan after 6-1/2 months in space. NASA Television will provide live coverage of the undocking and landing. The homebound crew is packing gear in their Soyuz vehicle and training to use the Lower Body Negative Pressure suit which gets their bodies ready for the return Earth’s gravity. In the midst of Soyuz departure preparations, the crew is also continuing the International Space Station’s mission of advanced microgravity science to benefit life on Earth and in space. There was more Rodent Research work on Friday as scientists study mice to understand the effects of weightlessness on muscles and bones. The crew is also participating in the Fine Motor Skills experiment which looks at how astronauts interact with touch-based technologies and spacecraft instrumentation. Expedition 42 crew members pose for a final crew portrait before they split up March 11, 2015. 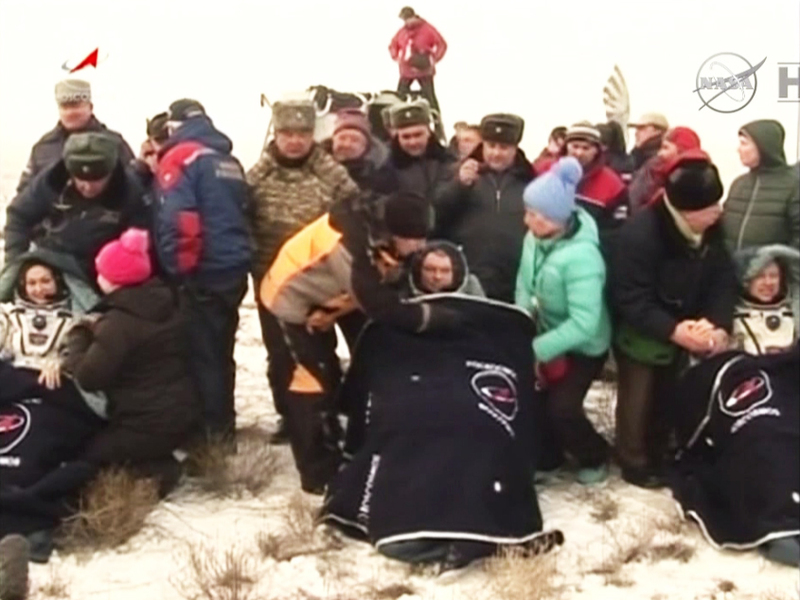 Cosmonauts Alexander Samokutyaev and Elena Serova and NASA astronaut Barry Wilmore returned to Earth a few hours later in the Soyuz TMA-14M spacecraft. The Expedition 43 crew members worked on science hardware Wednesday. Back on Earth, Russian flight controllers are planning to fire the thrusters of a docked cargo craft to raise the International Space Station’s orbit. Italian astronaut Samantha Cristoforetti completed the activation and testing of the new Muscle Atrophy Research and Exercise System (MARES). She also inspected cables and connectors on a science freezer for corrosion. Commander Terry Virts configured hardware and reviewed procedures for the Advanced Colloids Experiment Microscopy-3 (ACE M-3). Virts also conducted an annual certification review of the Microgravity Science Glovebox, inspecting and cleaning up around the rack. 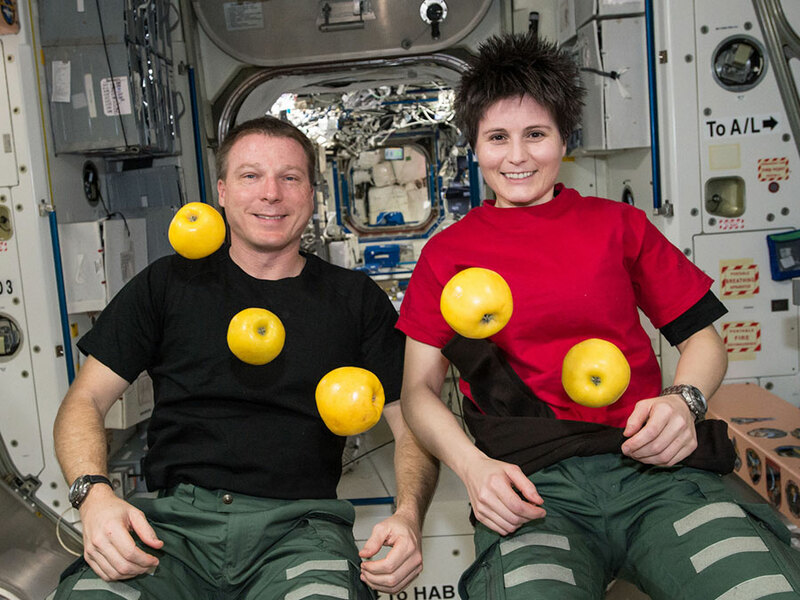 ISS042E136074 (01/15/2015) — US astronaut Terry Virts and ESA (European Space Agency) astronaut Samantha Cristoforetti are ready to select a fruit snack during a brief break from work aboard the International Space Station on Jan. 15, 2015. The apples, suspended in microgravity are easy targets. Both astronauts are flight engineers with Expedition 42. Expedition 43 Commander Terry Virts and Flight Engineers Samantha Cristoforetti and Anton Shkaplerov practiced emergency procedures Tuesday, preparing the three crew members for the actions they would take in the unlikely event that they must evacuate the International Space Station. Cristoforetti went back to work on the Muscle Atrophy Research and Exercise System (MARES). She will be setting up MARES hardware inside the European Columbus lab module over the next two days. Virts assisted her with the MARES deployment just before lunchtime. Virts later moved to the U.S. Destiny lab module to pack up a physics experiment in the Microgravity Science Glovebox. The commander stowed the Coarsening in Solid Mixtures-4 (CSLM-4) experiment, an investigation studying solid-liquid mixtures, which will be returned on a future SpaceX Dragon mission. Meanwhile, Soyuz TMA-16M Commander Gennady Padalka and One-Year crew members Scott Kelly and Mikhail Kornienko are preparing for launch on March 27, when they will join Expedition 43 at the orbital laboratory. Kelly and Kornienko will stay in space until March 2016. 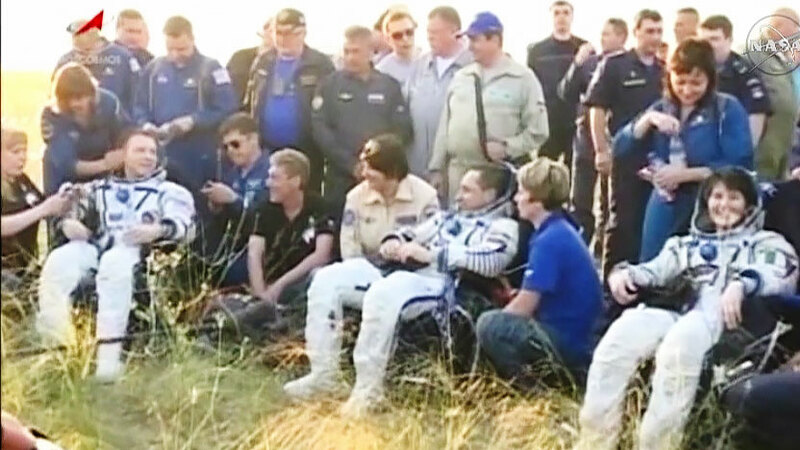 Padalka will return to Earth Sept. 11. 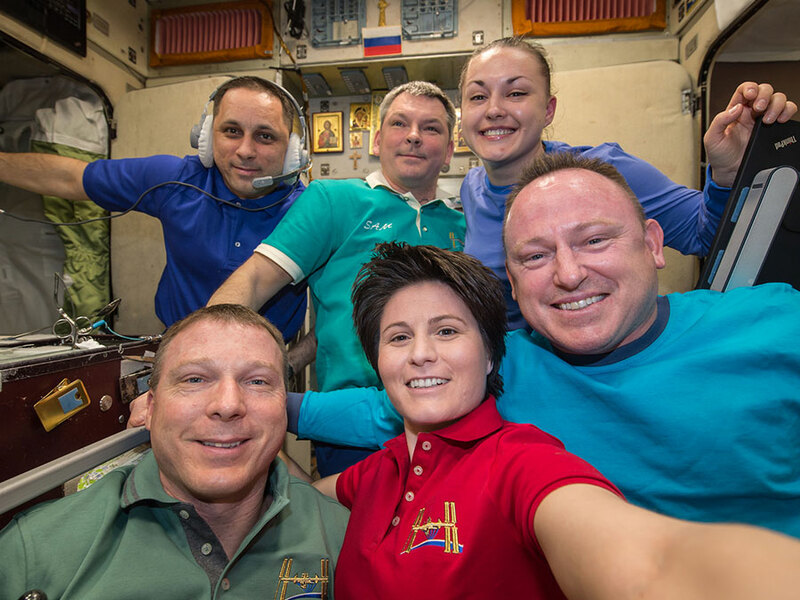 Expedition 43 Commander Terry Virts and Flight Engineers Samantha Cristoforetti and Anton Shkaplerov are resting today after sending their Expedition 42 crewmates back to Earth last night. Expedition 42 Commander Barry Wilmore handed the controls of the International Space Station to Virts in a Change of Command Ceremony Tuesday morning. 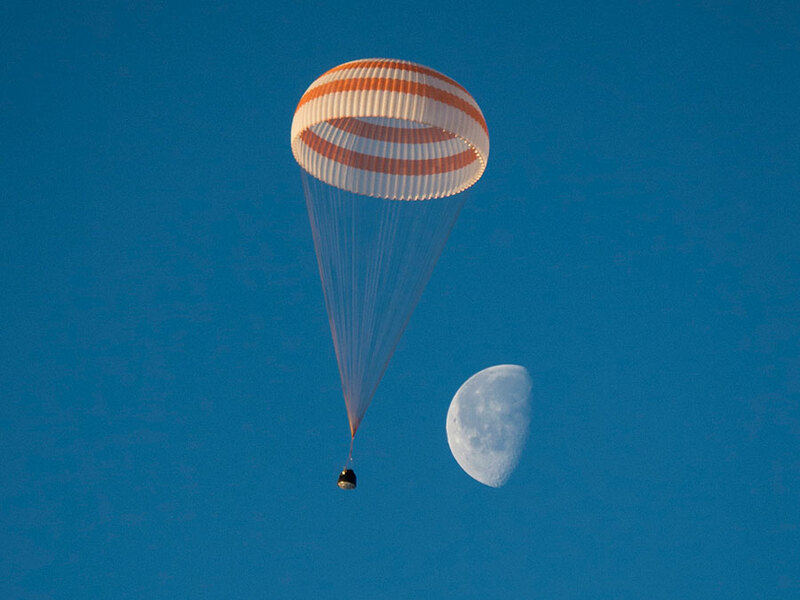 Wilmore, Soyuz Commander Alexander Samokutyaev and Flight Engineer Elena Serova completed their mission after landing in Kazakhstan about 10:07 p.m. EDT Wednesday. They entered their Soyuz TMA-14M spacecraft then undocked from the Poisk module at 6:44 p.m. when Expedition 43 officially began. Some of the return cargo flown aboard this Soyuz was used as part of research investigations aboard the International Space Station. Researchers on the ground are waiting on the return of 17 area dosimeters from one such study, the Area Passive Dosimeter for Life-Science Experiments in Space (Area PADLES). These area dosimeters continuously monitored radiation throughout Kibo, the Japanese Experiment Module. The dosimeters gathered information about space radiation to help manage exposure and provide protection to crew members. Researchers may use data from Area PADLES to design new radiation monitoring equipment for astronauts and people who work in medical or industrial areas with potential radiation exposure. This knowledge also may help develop better protective measures for the life sciences studies that occur within Kibo. Futhermore, the results from this research could improve design for future spacecraft structures that will shield internal occupants from radiation. › Read more about Area PADLES. Russian scientists are expecting the return of two incubation containers with planarian worms aboard this Soyuz spacecraft. The Effect of Weightlessness on Processes of Regeneration by Electrophysiological and Morphological Factors (Regeneratsiya-Planaria (Regeneration-Girardia)) investigation is an assessment of the impact of microgravity on the structural and functional regeneration of amputated organs and tissues of planarian worms. Planarian worms, known for their regenerative processes, can be cut into pieces and each piece can grow back into a complete organism. Study of these organisms in microgravity may have implications for human health and disease, including development of methods for repairing damaged tissue from injury or physical impairment. › Read more about model organisms in space station research. Expedition 42 Commander Barry Wilmore of NASA, and Alexander Samokutyaev and Elena Serova of the Russian Federal Space Agency landed their Soyuz TMA-14M spacecraft in Kazakhstan at approximately 10:07 p.m. EDT. 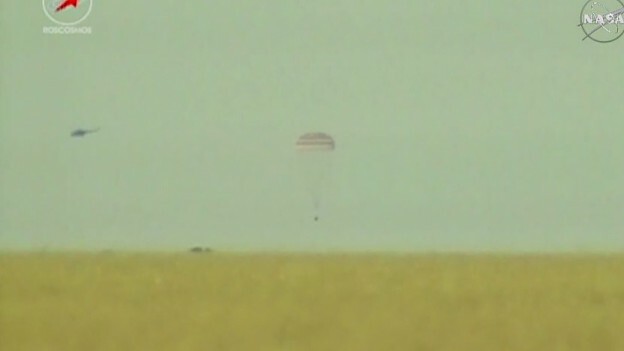 Russian recovery teams are helping the crew exit the Soyuz vehicle and adjust to gravity after their stay in space. The trio arrived at the International Space Station on Nov. 23, 2014, and spent more than five months conducting research and technology demonstrations. Wilmore, Samokutyaev and Serova spent 167 days aboard the space station and clocked almost 71 million miles during their time in space. Wilmore now has logged 178 days in space during two missions, the first of which was on space shuttle mission STS-129 in 2009. Samokutyaev now has spent 331 days in space on two flights, the first of which was on Expedition 27/28 in 2011. This was Serova’s first flight into space. 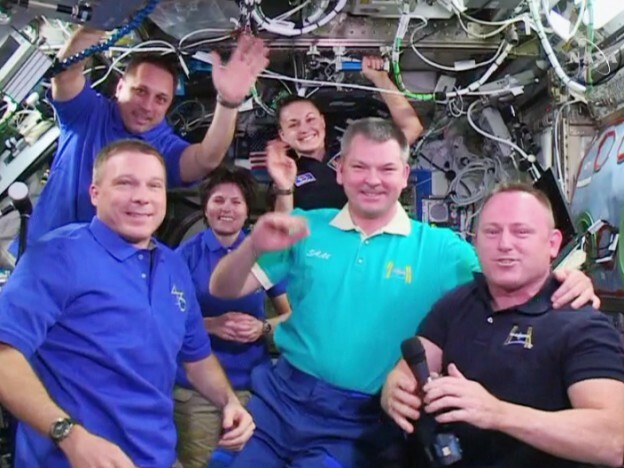 The station now is occupied by Expedition 43 Commander Terry Virts of NASA, Flight Engineer Samantha Cristoforetti of ESA and Anton Shkaplerov of the Russian Federal Space Agency. They will remain aboard the station to continue research and maintenance until the remainder of the Expedition 43 crew arrives later this month. NASA astronaut Scott Kelly and Russian cosmonauts Mikhail Kornienko and Gennady Padalka, are scheduled to launch from Baikonur, Kazakhstan, March 27 U.S. time (March 28 Kazakh time). Kelly and Kornienko will spend a year aboard the complex collecting valuable biomedical data that will inform future deep space, long-duration missions. 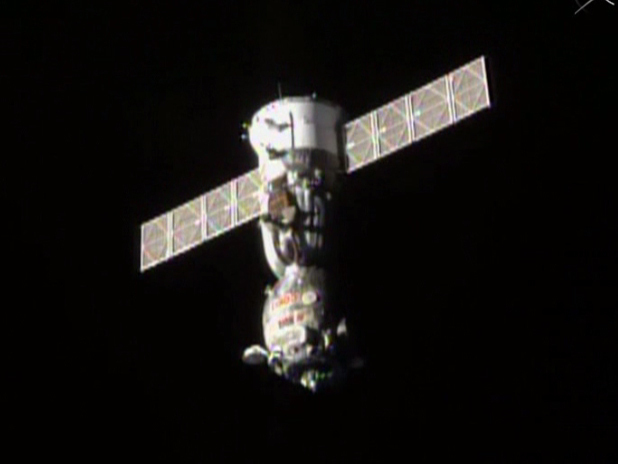 After spending 167 days aboard the International Space Station, Barry Wilmore, Alexander Samokutyaev and Elena Serova undocked from the station at 6:44 p.m. EDT to begin their voyage home. Samokutyaev, the Soyuz commander, is at the controls of the Soyuz TMA-14M spacecraft. They will perform a separation burn to increase the distance from the station before executing a 4-minute, 41-second deorbit burn at 9:16 p.m. 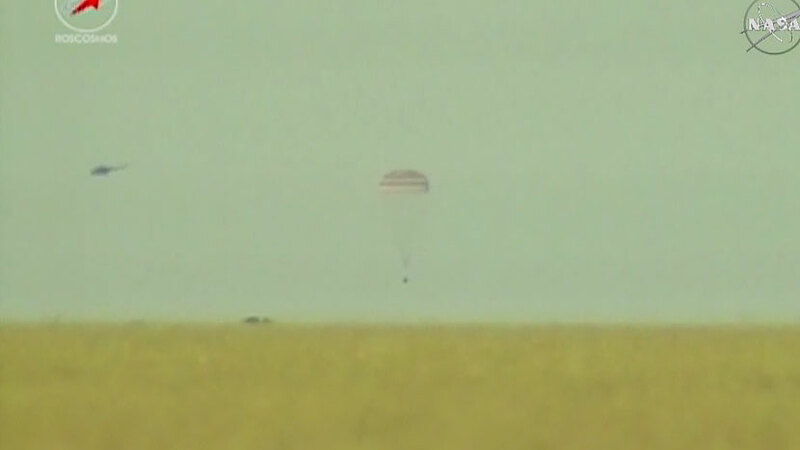 The crew is scheduled to land at 10:07 p.m. southeast of Dzhezkazgan, Kazakhstan. The departure of Wilmore, Samokutyaev and Serova marks the end of Expedition 42. The Expedition 43 crew members, Commander Terry Virts of NASA, Samantha Cristoforetti of ESA and Anton Shkaplerov of Roscosmos will continue research and maintenance aboard the station and will be joined on March 27 by three additional crew members, NASA’s Scott Kelly and Roscosmos’ Mikhail Kornienko and Gennady Padalka. NASA Television will air live coverage of the Soyuz TMA-14M deorbit burn and landing beginning at 9 p.m. Here is the timeline for Expedition 42’s landing. At 3:34 p.m. EDT, the Soyuz hatch closed between the International Space Station and the TMA-14M spacecraft. Expedition 42 crew members Barry Wilmore of NASA and Alexander Samokutyaev and Elena Serova of Roscosmos are preparing to undock at 6:44 p.m. NASA Television will air live coverage of undocking beginning at 6:15 p.m. The deorbit burn is targeted for 9:16 p.m. and will lead to a landing at 10:07 p.m. southeast of Dzhezkazgan in Kazakhstan. NASA TV coverage of deorbit and landing begins at 9 p.m. Watch live at https://www.nasa.gov/nasatv. Today is homecoming day for International Space Station Commander Barry “Butch” Wilmore of NASA and Flight Engineers Alexander Samokutyaev and Elena Serova of the Russian Federal Space Agency (Roscosmos) as they prepare for landing in their Soyuz TMA-14M spacecraft at 10:07 p.m. EDT this evening, southeast of Dzhezkazgan, Kazakhstan. At this time, there are no concerns or issues being worked. Wilmore handed over command of the orbiting complex to fellow NASA astronaut Terry Virts in a ceremony on Tuesday, March 10. 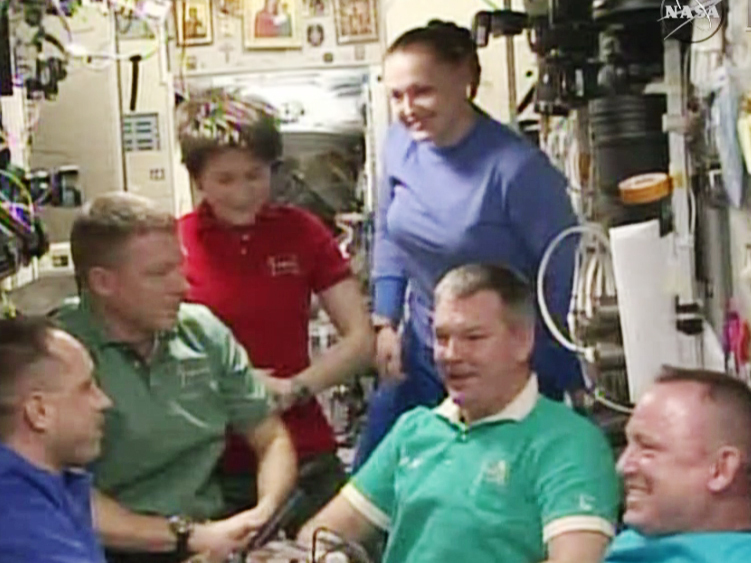 When the Soyuz undocks, Expedition 43 formally will begin. NASA Television coverage times for Soyuz activities are listed below. These activities also will stream online at https://www.nasa.gov/ntv. Here is a timeline of the Expedition 42 undocking and landing. Expedition 42 Commander Barry Wilmore handed over control of the International Space Station to NASA astronaut Terry Virts in a Change of Command Ceremony today. Virts will lead Expedition 43 when Wilmore and Soyuz Commander Alexander Samokutyaev and Flight Engineer Elena Serova undock Wednesday at 6:44 p.m. EDT in their Soyuz TMA-14M spacecraft. Back on Earth, a new Expedition 43 trio is relaxing as they count down to their March 27 launch. Riding with Soyuz TMA-16M Commander Gennady Padalka are One-Year crew members Scott Kelly and Mikhail Kornienko who will live in space until March 2016. Padalka will stay in space till September. Meanwhile inside the station, Virts continues installing cables so future commercial crew vehicles can communicate with a pair of International Docking Adapters to be installed later this year. He and Flight Engineers Anton Shkaplerov and Samantha Cristoforetti also reviewed their emergency roles and responsibilities and practiced communication and coordination.